Rampant corruption and unprecedented rigging in the Dhaka-10 by-poll are reminiscent of the elections held in the forlorn days of military rule. Once again people have been denied their right to vote; this time by a government that enjoys absolute majority in the parliament. July 1. 10:30 in the morning. At the Udayan High School polling centre, a group of Jatyatabadi Chatra Dal (JCD) leaders were seen lurking around the area, which had as many as 2,619 votes. "Don't waste your time here. Your votes have been cast; have ice-cream and leave the place," a JCD worker told six voters. "Our strategy was quite simple. In the first hours of the day, we cast votes of those who were unlikely to cast for Falu bhai," said a BNP-loyalist to the Daily Star (DS) reporter. "The party hierarchy said we would be held responsible if Falu bhai fails to get 80 percent of the votes in this centre," another JCD leader reasoned for this unsolicited service to the voters. The same old farce was re-enacted in all the 103 polling stations of the constituency. Rigging, in fact, began literally before the election saw the light of the day. Truckloads of BNP-men-- most are not voters of the area-- gathered at different parts of the city in the early morning of July 1. The much-talked about by-poll turned into a sham within two hours. "Fake voters from Demra, Lalbagh, Kamrangir Char, Motijheel and Shabujbagh 'cast' votes mostly between 8 am and 10 am," a DS report says. Most of the polling centres remained off-limits to the agents of the opposition Bikalpa Dhara Bangladesh (BDB). Hoodlums belonging to the ruling party even manhandled BDB candidate Major (retd) Abdul Mannan in the Hossain Ali Primary School centre in the early morning. "The government did not deploy the army at the polling centres," an angry Mannan told the journalists while leaving the booth in a press car. "I had no option but to boycott the election and appeal to the election commission to cancel the Dhaka-10 by-poll," he continued. Two voters press stamps against their ballot papers in the open rather than inside the polling booth at a centre at Curzon Hall at Dhaka University. But Safiur Rahman, the ACEC, did not buy Munsef's idea. "The High Court order (regarding deployment of army in every polling centre) was flouted and there was no polling agent of Bikalpa Dhara at most centres," Safiur told the awaiting journalists. "Voting was unrealistic at some times…I can only say the poll was not totally satisfactory," he continued. 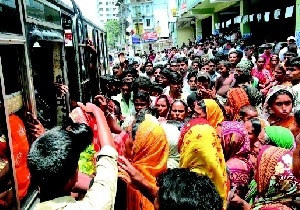 Hired voters being herded on to a bus in front of Bishal Centre in Moghbazar on an impersonation mission. The ACEC's first-hand knowledge about the by-poll, however, was unmistakably sour. While visiting the BG Press Government Primary School polling centre Safiur found around 50 percent votes had been already cast, though he could not find a single voter in the booth. The ACEC, however, has refused to cancel the results of the by-poll. We do not have any evidence of polling centre captures or stuffing of ballot boxes, he said. Election cannot be annulled on the ground of the absence of army alone, he continued. Safiur, however, said, "I hope legal action will be taken against individuals responsible for the violation of electoral laws. The High Court will take legal action if the matter is brought to its cognisance." The EC has not done that yet. All is well in the BNP camp though. While independent observers have denounced the result by terming it "a farce", Abdul Mannan Bhuiyan, the BNP general secretary has described the election as "free, fair and peaceful". Bikalpa Dhara contested the election not to win it; they just participated in the polls only to bring allegations against the BNP as a strategy for its publicity, the BNP secretary general claims. Sharmeen Murshid, chairperson of Brotee, an independent election monitoring organisation, has a different story to narrate. "We, citizens and voters, note with concern, shame and anger the degradation of the election commission from an independent constitutional body to a mere expansion of the government and a tool in the hands of subsequent governments to manipulate elections," she said while presenting Brotee's report on Dhaka-10 by-poll. 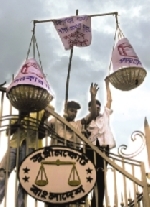 Bikalpa Dhara activists, left, set up a bamboo-made scale, tilted heavily to one side, to symbolise a more weighty government than the High Court. Party Lawmaker Mahi B Chowdhury, in the middle of first row, along with party activists lies down at the main entrance to the High Court building to protest against vote rigging by the ruling alliance in Dhaka-10 by-polls. Muhammad Abdul Matin, secretary general of Fair Election Monitoring Alliance (FEMA), agrees. Matin describes the election as "an unusual event in the history of the country", and a "one sided show". Sacks of ballot papers in the possession of the assistant presiding officers of most of the polling stations were found to have been stamped in advance with official seal of the EC to provide ample scope for stuffing, a FEMA report says. The participation of voters, according to Brotee's report, was very low too. Though the total presence of voters is recorded as 73 percent, the average vote cast was a mere 38 percent; 35 percent of the genuine voters left the booths without casting their ballots, the report alleges. "Of the 38 percent votes cast, 55 percent were false, and the rest 45 percent were genuine," Brotee, which has used "vote matrix" to monitor the by-poll, says. The BDM, meanwhile, staged demonstrations at the entrance to the High Court on July 8. The BDM workers carried a coffin and a scale to protest what they said "the death of democracy and massive rigging in the by-poll". "These are all about Dhaka-10 by-poll. The coffin is the symbol of the corpse of democracy," Mahi B Chowdhury said.